Turmoil has enveloped the Nevada Public Utilities Commission. And for good reason. Now Gov. Sandoval has pushed out Commissioner David Noble, where he began his career as an administrative attorney in 1997, before being appointed by Sandoval as a commissioner in 2011, and reappointed in 2012. David Noble was the prime mover behind the PUC’s “Christmas Bait and Switch” decision that effectively shut down the rooftop solar industry in Nevada, throwing thousands of solar workers out of work and retroactively changed the rules to harm 17,000 Nevadans who had already invested in rooftop solar systems. Voters in Nevada have been in revolt ever since Checks and Balances began its work to unmask utility industry influence. Perhaps it’s all adding up to some measure of accountability. On August 25, 2015, we sent a Freedom of Information Act records request to Commissioner Noble asking that he provide “all records evidencing or regarding communications or meetings between Commissioner David Noble and any representatives of NV Energy and/or EEI” including all “meetings calendars for the above-referenced dates, electronic or paper, irrespective of device” beginning on February 17, 2012, through the date of the request. You can read the entire request HERE. Yet Commissioner Noble refused, through Weir, to comply with our lawful records request and let the public know with whom he had been meeting. Now the questions have become too great for even Gov. Sandoval to ignore. 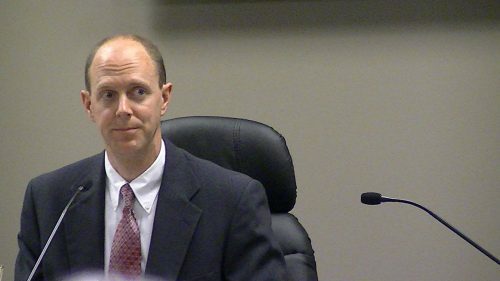 Is Commissioner David Noble a captured regulator, acting not on behalf of the people his agency was created to serve, but a rather the powerful utility he was supposed to oversee? Did Commissioner David Noble evolve into being a consultant helping NV Energy achieve its goals? Now that he’s on his way out the door, we can only hope that his replacement is a fair arbiter of the state’s energy future, willing to be transparent as the law demands. The citizens of Nevada deserve nothing less. Scott Peterson is executive director of Checks and Balances Project, a national watchdog blog that seeks to hold government officials, lobbyists and corporate management accountable to the public. Funding for C&BP comes from clean energy philanthropies and donors.